Dimensions are 23" deep X 36" wide X 72.6 tall. 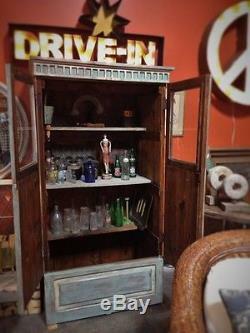 Made from old wooden crates! Wonderful One of a kind. Can be seen/ picked up at. The item "Depression era, 1930 1940's, Tramp Art Cupboard, Chalk Paint by Annie Sloan" is in sale since Wednesday, August 14, 2013. This item is in the category "Antiques\Furniture\Cabinets & Cupboards\1900-1950". The seller is "nowthatsaclassic" and is located in Salem, Massachusetts. This item can't be shipped, the buyer must pick up the item.